WASHINGTON, D.C. -- The late U.S. Sen. John McCain was one of the best-known and best-liked U.S. politicians of this political era. Gallup tracked Americans' views of McCain periodically beginning in 1999. McCain's favorable rating stood above 50% most of the time but started below it in 1999, when he was not a generally well-known figure, and fell below it in 2007, as he ran for the GOP presidential nomination. McCain spent significant time in the public limelight, with at least seven in 10 Americans able to offer an opinion about him since 2000. Since his second presidential run in 2007-2008, McCain's familiarity rating was typically over 90%. Gallup's final update of McCain's favorable rating in August 2017 found his popularity at its highest level in almost a decade. Nearly six in 10 Americans (58%) said they had a favorable view of the Arizona Republican, up five percentage points from the previous reading in 2015. The reading was also four points higher than McCain's average favorable rating between 1999 and 2017. McCain would also rank fifth on the December 2017 list of men Americans say they most admire, his sixth top 10 finish overall and his first since 2012. Gallup first measured public perceptions of McCain in February 1999, when he was widely seen as a likely candidate for the 2000 presidential election. Americans were not much familiar with McCain then, with 65% saying they had never heard of or had no opinion of the third-term U.S. senator. Still, more Americans liked rather than disliked McCain -- with 27% of U.S. adults viewing him favorably compared with the 8% who had an unfavorable view. Americans gradually became more familiar with McCain over the course of 1999, and by the end of the year, when McCain was a declared candidate for the presidency, most Americans (57%) expressed a favorable view of him. Still, McCain was a clear underdog in the race for the GOP nomination, facing George W. Bush, who enjoyed the solid support of party leaders. To some extent, McCain was able mitigate this disadvantage by running what was considered then an "insurgent" or buck-the-establishment type of campaign, especially given its main plank of reforming the nation's campaign finance laws. The high-water mark for McCain's campaign came when he scored a decisive victory in the New Hampshire primary, the second contest in the process. The victory, in turn, made McCain an even more popular figure with the country at large, with an early February poll finding McCain's favorable rating climbing to 67%. While McCain would hit this favorable rating one more time in the years that followed, he never exceeded it. Ultimately, though, McCain's campaign for the 2000 GOP presidential nomination fell short. McCain's popularity, though impressive, provided him no real competitive advantage over an equally popular Bush. McCain officially withdrew from the GOP presidential race in March 2000, but his run for president had made him a popular figure and, as a result, probably a more effective legislator. McCain was better liked than many of his other prominent colleagues in the 2001-2002 Congress, with a March 2001 Gallup poll putting his favorable rating at 61%. This rating was higher than those of two other prominent senators also asked about in the poll -- Democrat Joseph Lieberman (52%) and Republican Strom Thurmond (28%). This enhanced standing likely helped McCain achieve the top policy objective of his presidential campaign -- campaign finance reform -- with the signing of the McCain-Feingold bill into law in early 2002. Early on in the G.W. Bush administration, McCain's relative standing with the two major political parties fluctuated somewhat. Republicans viewed him more favorably in March 2001 than did Democrats, by 66% to 61%, but slightly more Democrats than Republicans said they had a favorable view of McCain in other Gallup polls conducted in 2001 and 2002. But the larger trend during the early to middle Bush years saw McCain's favorable rating fall overall, likely because the GOP senator was no longer featured as prominently in the news as during his first presidential run. McCain wasn't becoming unpopular -- his unfavorable rating was essentially static over this time. 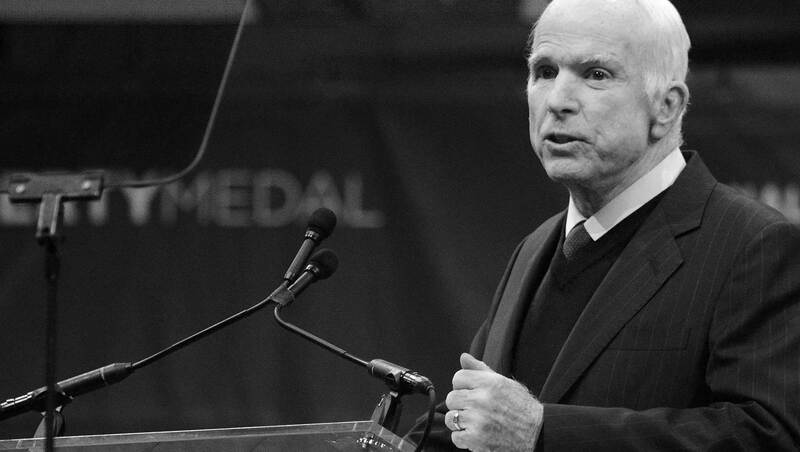 In the final years of the Bush administration, new forces altered McCain's public image. The Arizona senator was a forceful supporter of the Iraq War, which had become very unpopular by this time. By February 2007, as McCain supported the Bush administration's "surge" in Iraq, his popularity fell to 48%, the first time less than a majority of Americans had a favorable view of McCain since 1999. 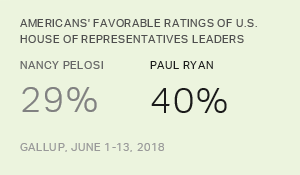 Among Democrats, his favorable rating fell to 41% at this time, from 56% seven months earlier. While McCain did not officially launch his second presidential bid until late February 2007, the Republican senator began to campaign unofficially for the post in the early months of that year, with the media frequently covering his events or statements. Perhaps as a result of the attention, a Feb. 9-11, 2007, poll found McCain's favorable rating recovering to 57%, with his image improving by 14 points among Republicans. Yet McCain's path to the GOP nomination in his second presidential campaign would not be a smooth one. By the summer of 2007, many political journalists and analysts believed McCain's campaign was effectively dead, as the operation struggled to raise money and witnessed several high-profile staff resignations. 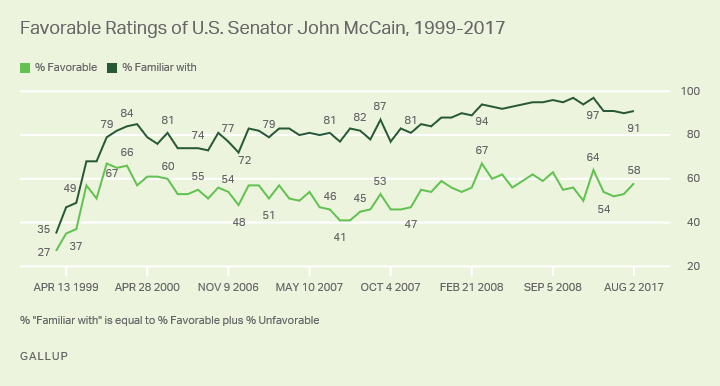 These public woes may be why McCain's net favorable rating fell into negative territory for the first and only time in August 2007, with 41% of Americans viewing McCain favorably and 42% viewing him unfavorably. Still McCain's favorable rating among Republicans remained competitive with that of the most popular GOP candidate in the field that year, Rudy Giuliani. And by the end of 2007, Gallup noted that McCain's ratings "had recovered to the point where his net favorable was on par with where it was" at the beginning of 2007. On Jan. 8, 2008, McCain won, for the second time in two presidential runs, the GOP New Hampshire primary and quickly became the front-runner for the GOP nomination. By March 2008, when McCain effectively sewed up the nomination, his favorable rating tied its highest level ever at 67%. But McCain, who had long enjoyed broad bipartisan appeal for nearly a decade, was now nearly twice as popular with Republicans as Democrats -- with the former giving the Arizona senator a 90% favorable rating and Democrats a 49% favorable rating. But in the current politically polarized period, it is to be expected that the image of a major presidential party nominee will be viewed through a partisan lens. Even if McCain's image became somewhat more polarizing over the 2008 campaign, the Arizona Republican senator ranks as one of the best-liked presidential candidates since 2000, with an average of 58% of Americans having a favorable opinion of him during the general election. 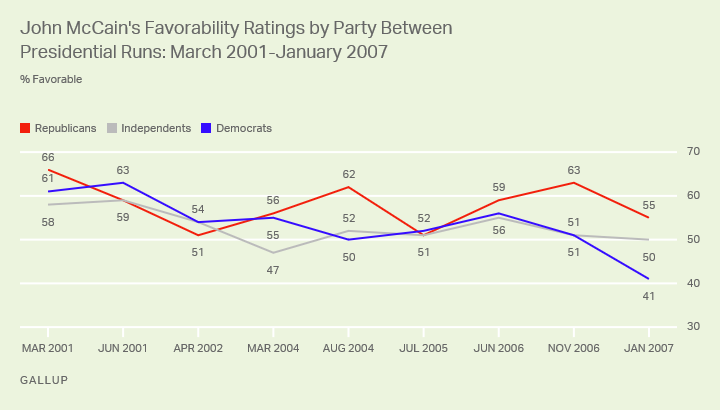 Only Barack Obama in 2008 and George W. Bush in 2000 had higher general-election favorable rating averages. McCain lost the presidential election to Obama on Nov. 4, 2008. As has happened with most losing general-election candidates, a post-election Gallup poll found McCain's favorable rating rising to a near-personal high of 64%. More than nine in 10 Republicans (92%) viewed McCain favorably at that time. However, less than half of Democrats, 41%, had a favorable view of the defeated candidate. About one year later, in October 2009, McCain's favorable rating fell back to a more typical level, at 54%. Republicans' affection for their erstwhile standard-bearer cooled over that time, falling to 72%. Meanwhile, McCain remained essentially as unpopular with Democrats as he had been after the election, at 39% favorable. Nor would Democratic attitudes improve in 2013, the next time Gallup measured McCain's favorable rating. Some five years removed from the 2008 contest, still only about four in 10 Democrats (42%) had a favorable view of McCain. Likely one source of friction was McCain's outspoken criticism of the Obama presidency, especially in the realm of foreign policy. By 2015, McCain was again beginning to resemble the bipartisan figure he had often been, with 61% of Republicans and about half of Democrats (49%) having a favorable view of him. Democratic sentiment regarding McCain, however, would surge in August 2017, climbing 22 points to 71%. The context for the rise in the support was McCain's dramatic, not entirely expected vote against a Senate bill that intended to repeal the Affordable Care Act, a vote that led to the bill's failure on the Senate floor and that delivered a major policy defeat to the Trump administration. Not surprisingly, McCain's favorable rating with Republicans dropped after this incident, falling from 61% to 51%. However, the senator's overall favorable rating rose to 58%, a five-point increase from the previous reading. Despite McCain's failed bids for the presidency, there is little doubt that, over the long arc of his public career, most Americans viewed the Arizona Republican favorably -- not to mention that more than a few Americans cited McCain as the man they most admire over these years. Few politicians in this day and age can boast such a resoundingly positive verdict from the people.